Me: So while I was in California my friends let me borrow their car so I could drive down the coast to Monterey Bay. Dad: What kind of car was it? The make of the car is the least interesting part of that story to me, but not to Dad. He doesn’t understand how I couldn’t know what I was driving. But, because of Dad, by default I’ve absorbed some car guy characteristics. I lived in the middle of nowhere where getting your driver’s license as soon as you possibly could was not only expected, but a requirement if you wanted any kind of social life at all. The nearest town with a movie theater was fifteen miles away. I was in school every day with friends who lived over forty road miles away. So, the day I turned sixteen I applied for my learner’s permit and a few short months later had my driver’s license. I’ve driven a lot of cars and covered a lot of miles in the last forty-some years. But, I’ve always thought of a car as a tool, a really expensive hammer, if you will. It’s not a status symbol. It’s not an extension of my personality (except in some ways everything a person owns or does is an extension of their personality). It’s not something that brings me a specific kind of pride. It’s a tool that gets me from point A to point B and makes my life easier. In terms of expense and frustration, it can also be a burden. I’ve owned cars I’ve hated. I’ve owned cars I’ve loved. I’ve owned cars I don’t even remember anymore. At some point they’ve all let me down. I have a complicated relationship with cars. My first car was a green 1973 (I think), Plymouth Satellite, a two-door monster of a car. I have no idea how I ever learned to parallel park in that thing. Dad had been driving it to work six nights a week, so it had a lot of miles on it when I inherited it, along with the attendant mechanical issues that go with mileage. This car had a specific issue with soft plugs. What the hell is a soft plug, you ask? Wikipedia describes them, by several different names, like this: Core plugs are used to fill the sand casting core holes found on water-cooled internal combustion engines. They are also commonly called frost plugs, freeze plugs, or engine block expansion plugs. The problem with them, at least for me, is that if they rust through, which they did, or simply blow out from pressure, which they also did, your car immediately loses all of its antifreeze, overheats, and leaves you stranded. This happened with my Satellite a dozen times or more. Every car I’ve ever owned, and there have been a lot of them, have been used. Some of them have been great, others, not so much. All of them have come with their share of problems. Dad insisted that I learn basic maintenance, and I’m eternally grateful he did. I can change tires and change my oil. I’ve gotten pretty good at diagnosing problems and even fixing some that are more involved. Once, when I had just left home to drive to DC for a weekend, I noticed my battery light was on. I went home, thought about it, realized it was probably my alternator, walked to a parts store, replaced it myself, and was on the road less than two hours later, much to the amazement of the friends I was staying with. Maybe it’s true of every driver, but I have a litany of car stories. I have hit a deer twice in my life, though neither time caused much damage to my car. The deer weren’t so lucky. Several times I have broken down miles, or even hours away from home and had to be towed and wait for someone to come get me. Fred and I sat in a rest stop in Ohio for around nine hours one Saturday, unable to get in touch with anyone back home who could do anything. My pal Zordon (of Mighty Morphin’ Power Rangers fame), twice drove for over two hours to rescue me. I broke down on 79 North, and after meeting someone I’m sure may have been an angel (in the Wings of Desire sense, anyway), the woman I was going to visit came to get me and drove me back to Pittsburgh. I called Dad and arranged for him to rent a tow hitch so we could go get the car and tow it back to our mechanic. 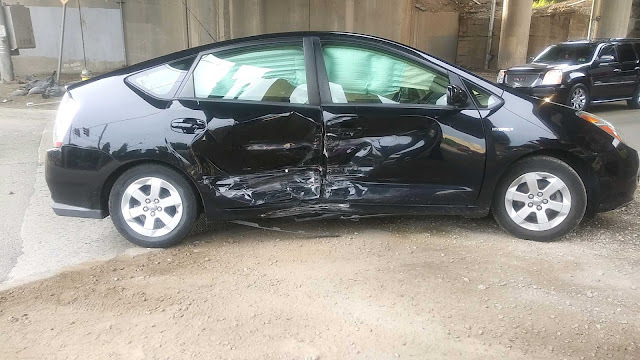 Right before he arrived to pick me up the next morning I got a call from the state police telling me that a driver had fallen asleep and crashed into my parked car, totaling it while I was away. I had done nothing illegal and was parked well off the road, but my car was a goner. In that case it worked out. The insurance value of the car ended up being more than I had bought it for. Ever since, whenever I’m having car trouble I’ve been tempted to just park along the highway and hope for the best. I’ve run over a Christmas Tree and been rear-ended by a dead man. Three years ago, on the way home on New Year’s Eve, my car died. It was the transmission. I knew immediately because this was the third car in my life where the transmission went bad (by contrast, my father, who has been driving since the age of the Model T, has never had this happen). Fixing it would cost more than the car was worth, so I sold it for next to nothing and quickly, and probably foolishly bought another used car, pretty cheaply. Well, you get what you pay for. It was a mess. Rusted out underneath. There was a leak somewhere so the trunk was always damp. I kind of hated it, in ways I had never hated a car before. My mechanic flat out told me it wasn’t going to pass another inspection. One morning, on my way to get my new driver’s license, I discovered the driver’s side window was halfway down. The motor had burnt out, so it wouldn't go up or down. I knew, based on personal experience, that this was going to cost a lot of money, certainly more than a car that wasn’t going to pass inspection was worth anyway. As soon as I got back from the license center I went online to look for something else. I had been thinking about looking into a hybrid. I liked the environmental aspect of it, but I was also fond of the better gas mileage. A good friend of mine had a 2008 Toyota Prius that I had ridden in and liked. I figured even a used one was out of my price range, but on a whim I thought I would look just to see. And there it was, the first car that popped up in my search. A 2008 Toyota Prius, solid black and beautiful... and in my price range. Okay, the upper end of it, but still there. With very little deliberation I called the dealer to make sure it was still there then drove out to take a look at it, my side window still stuck in the halfway position. I test drove it, I loved it, and they made me a deal I simply couldn’t pass up. So, in June of 2017, I came home with the first car in my life that I truly loved and was genuinely proud of. This story doesn’t end well. A little over a year later, last summer, I was t-boned by another driver and my car was totaled. It could have been far worse. There were three passengers in my car, and two in the one that hit me, including a child. We all walked away without a scratch. My side airbags deployed, which I’m sure saved Marcel and Derrick from severe injury. This was my first serious accident ever, and the ‟What might have happened” still haunts me. No one blames me, and no one was hurt, but I still feel just a little nauseous if it comes up. The possibilities of that alternate reality are truly frightening to me, even though they are not real. But my car was done. I found myself genuinely mourning it (fully realizing that I had to the luxury of mourning only my car). All of the other cars I had sold or lost over the years just felt like breakups. You know, we had a good run, but it’s time to move on. Some were harder than others, but it was usually a mutual decision. This one felt like a death. The timing was bad, not that there would ever have been a good time for it. The accident took place the evening before I signed my contract to teach at Pitt, a mere three weeks before classes started. I had a vacation planned the following week, so I was out of town and couldn’t look for a replacement right away (I was in California, where I once again drove my friend’s car... you know, the blue one). I bought another Prius, bright red and four years newer. It’s a little smaller. I like it, but I don’t love it yet. I feel a little guilty about that. It feels like a rebound car, because I’m not really over the last one. But, we’re getting used to each other. I’m getting better mileage. We’re sharing the road. I haven’t had any car trouble yet. It’s not the love at first sight I experienced with the last one, but I know it’s better than any other car I’ve ever owned. Maybe my relationships with cars have always been complicated because I’m not a car guy, and they can feel it. Until the last one my approach was utilitarian. I took them for granted. No one wants to be treated like that, even if they are inanimate objects. I’m never going to be like Dad, but I can probably be a little more attentive. Wash them more often. Be proud of them. Don’t just pay attention when they’re giving me trouble. Be grateful for their service and their protection. Check my oil. Be more of a car guy.